Blood Orange Hefeweizen, anyone? Brewed with local wildflower honey, orange peel, coriander, and juice from more than 1,000 blood oranges, the only thing cooler than this drink is its locale. 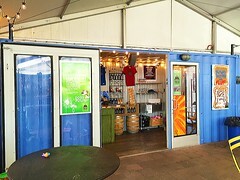 Slumbrew’s SOMBLOX, made from five shipping containers, is the place to go for a cold one after checking out Assembly Row’s thriving shopping scene. But more than that, it’s an integral component of an equally thriving community. Somerville, Massachusetts, is an emerging city outside of Boston, and Assembly Row is its Rodeo Drive or 5th Avenue. It’s a great place to shop; but it’s also just a great place to be. 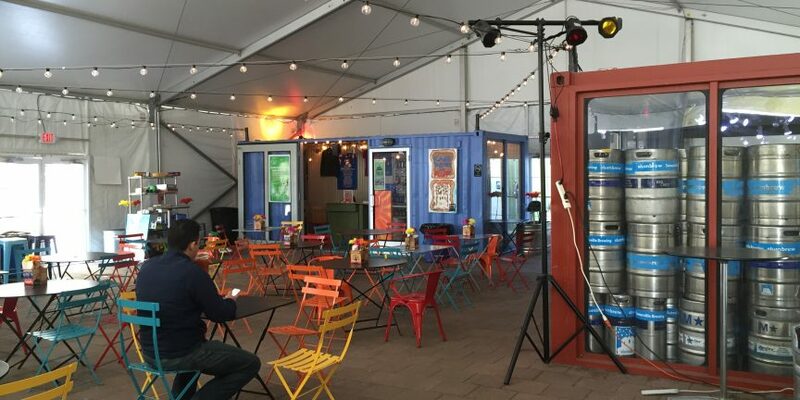 Slumbrew was making craft beer before it was a thing, and now they’re innovating again: SOMBLOX is the first retail/dining venue on the East Coast made of shipping containers. 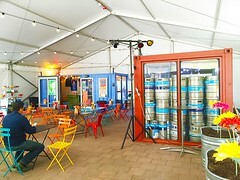 The new beer garden-style establishment is Slumbrew’s secondary location, featuring retail space, bar, and eatery. An additional container will soon house a small brewery. With the flagship space, though, why did Slumbrew want a presence on Assembly Row? They wanted to develop a presence in the community. (And, by the way, the community wanted them there; its support was instrumental in Slumbrew’s arrival on The Row.) This allows them to appeal to an entirely new demographic and expand their customer base. If a customer stops by for a drink one day and has a positive experience, they’ll be far more likely to return, to either the secondary or primary location. 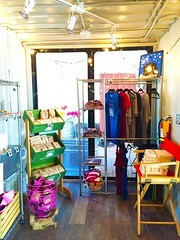 The location also allows them to capitalize on foot traffic. A nearby T (Massachusetts Bay Transportation Authority) stop delivers shoppers, tourists, and sightseers to the area. After a long day of shopping, what’s better than a relaxing drink, samples, or seeing how the suds are brewed? Somerville is the most densely populated city in New England. It used to be a manufacturing town, but when it fell on hard times, it became known as “Slummerville.” Today, though, it’s becoming a trendy, fun neighborhood. Slumbrew fits right in. SOMBLOX was the brainchild of urban planning and design company StreetWorks, in partnership with the Federal Realty Investment Trust (FRIT). FRIT owns a variety of shopping centers around the country, but they’re not the malls you remember from the ‘80s and ‘90s. 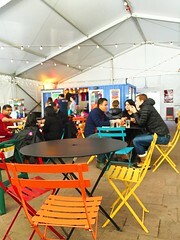 They create communities; beautiful, well-designed places where people can go to meet, eat, shop, and enjoy themselves. 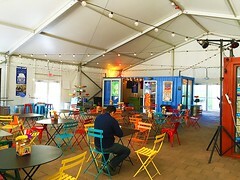 It’s a holistic experience, and every detail represents the unique “flavor” of the area. Slumbrew’s bold steel hotspot, for instance, pays homage to Somerville’s industrial past—and Assembly Row’s bright future. As with any new idea, there were challenges. 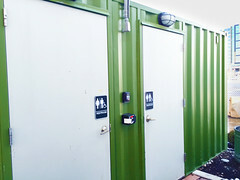 Because this was the first retail/eatery venue made of shipping containers on the coast, permitting was a major issue. 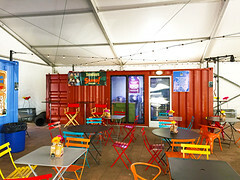 The Boxman Studios’ team helped educate the municipality on the concept of shipping container modification, and how this relates to their codes. The faster we can educate municipalities, the faster our customers can succeed. 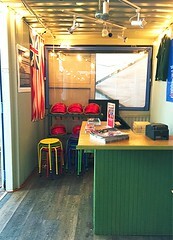 We build things out of shipping containers, but we’re problem-solvers at heart. A modular process like this should take about five to six months to complete. So, how does two months sound? Sounds like our kind of challenge. Everything, including compliance, had to be done in that timeframe, so we did it. We made sure wiring and plumbing were up to code, and recessed the containers to ensure they were American with Disabilities Act (ADA) compliant. In the end, we handled all the details so that Slumbrew could focus on the suds. When we say “Just add people” we mean it.